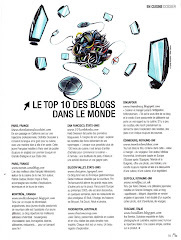 All right,we finally got it together to participate in an Is My Blog Burning? event. We'd been tempted by several IMBBs in the past ("egg" and "orange" come to mind); this one, though, we just couldn't pass up on (even if we are on the road at the moment). Tea has been an important part of our relationship since Michelle put together a "Tea Time with Anthony" tea sampler soon after we met. And these days, tea takes up almost an entire cupboard at our place. 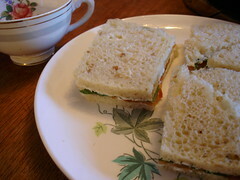 Pictured above is a watercress, smoked salmon, and cream cheese tea sandwich made with genmai cha bread. The bread took a number of tries to get right. Michelle experimented with several different amounts of tea and found that "more is more." She replaced the water in her bread recipe (a recipe for sandwich bread from R.L. Berenbaum's The Bread Bible) with a cup of dry tea steeped in the amount of water called for (3/4 cup). Actually it took a bit more liquid, because the tea swells so you have to compensate for this in order that you end up with 3/4 cup of strong tea. She also kept the toasted rice grains after she steeped the tea and added them to the bread to give it extra flavor and a bit more texture--we also wanted to try and retain genmai cha's distinctive character. This loaf was inspired by the green matcha bread served by Mariage Freres with some of their tea sandwiches. Our loaf didn't have nearly the color of the Mariage Freres loaf (we have a sneaking suspicion they add a bit of food coloring to their bread), but the main thing is that it was pretty delicious. The tea flavor was subtle (even with that strong batch), but it was certainly present and it went very well with the watercress and the smoked salmon. It's sure to become a standard at our house. Eventually Michelle wants to try a matcha loaf, too. For our sandwiches, we were dead set on using watercress because our little garden has produced so much this summer and we've been enjoying it so. We first tried a classic watercress sandwich with just watercress and butter, but found that combination a bit on the dull side (although a herbed butter would probably make for a very nice sandwich). We then decided to combine the spiciness of the watercress with some smoked salmon (and just a little bit of cream cheese). This combo was much more to our liking. Finally, we invited some guests over one afternoon and served our tea sandwiches with Kusmichoff's Troika tea, an old favorite. The setting wasn't the elaborate garden party we'd originally imagined--it was just our living room--but the company was lovely, the tea just as lively as ever, and the sandwiches were a hit. Just my luck that they should appear right now. 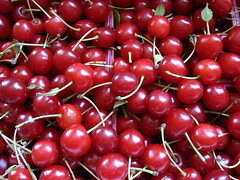 In 24 hours, I will be in California, far away from the perfect sour cherries which call to me from the Jean Talon market. My timing is disastrous. Our lovely tomatoes are ripening on the vine, including white heirloom ones which I've never tasted, and probably never will. I gave my sister instructions to pick them and eat them, then to write me and tell me what they were like. The fennel is in flower, as is the coriander. Who will harvest the seeds? And let's not mention the pollen. It's too painful. My mother's garden is overrun with the plumpest raspberries you've ever seen. I don't have time to do anything about it. Blackberries, gooseberries, black raspberries, oh, God, the currants. Not them, too. And I only had enough time to buy a half-flat of sour cherries which I used to make pickled sour cherries and a sour cherry almond preserve. What about my brandied cherries? And cherry syrup? Next year. I hope you all take full advantage of the short sour cherry season in my absence. Oh, and if any of you out there have any tips, food-related or otherwise, for San Francisco and Northern California please send them along. We love tips. 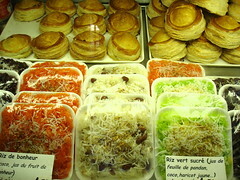 When you walk the streets in Paris, you'll notice that many of the cafes offer Croques Monsieurs or Madames. Like so many other clichés of French cuisine--French onion soup and the French omelet come to mind--most of these spots advertising their Croques Monsieurs and Madames aren't worth a second glance. However, if you're looking for a honest-to-goodness Croque keep your eyes open for those little signs that read "Pain Poilâne." Poilâne was started in 1932 by Pierre Poilâne, and what distinguished Poilâne bread was its use of stoneground flour and natural leavener at a time when bread baking in France was rapidly moving away from those traditional methods and towards "modern" baking methods. By the immediate post-World War II Poilâne was already completely anomalous in a country that had fully embraced white breads. Pierrre's son Lionel took over the operation beginning in the 1970s and he began to completely overhaul the way Poilâne baked its bread, introducing an extensive number set of changes that he labeled "retro-innovation." Lionel's program combined a deep respect for the tradition of French bread baking borne out of a profound sense of the history of bread baking with a hard, scientific approach to the technical aspects of making and baking bread. I remember reading a long Smithsonian profile on Lionel Poilâne back in the mid-1990s and being fascinated with the kind of improvements he'd made to the firm's traditional ovens. I also remember spending hours contemplating what Poilâne meant when he said that bread was closer to beer than it was to other foods, including baked goods (or at least it should be). It's safe to say that Lionel Poilâne's program of "retro-innovation" was one of the principal thrusts behind the international resurgence of artisanal sourdough baking over the last quarter of a century. Sadly, Lionel Poilâne passed away a couple of years ago in a helicopter accident. The Poilâne firm has continued to undergo change since his demise. These days the enterprise includes two stores in Paris and a store in London, as well as a mail order service that ships Poilâne's distinctive sourdough loaves all over the world. The simplicity of the original storefront on Rue Cherche-Midi in St-Germain des Près belies the complexity of the operation, but this storefront is still the perfect setting for Poilâne's rustic loaves sold whole, by the half, or by the quarter. When our friend Camilla asked us if we wanted anything from Paris just before she hopped on a plane to go on vacation there, we put in an order for a quarter loaf from Poilâne. By the time that loaf got to us it was a little worse for wear, but those traditional sourdoughs are a hearty breed and it was still making for the best breakfast toasts you can imagine. But what we most excited about making with our Poilâne loaf were Croque Madames. We got some Gruyère cheese, some nice ham, and some eggs, cooked up our Croque Madames and served them with a salade composée and a couple of beers. It was a little taste of Paris right in our own kitchen and it was heaven. Thank you, Camilla. Thank you, Lionel. So, the other night a party of three of us went up to the newest incarnation of Nonya, up on Bernard. Nonya started offering up relatively simple Indonesian dishes at a location of St. Laurent down below Sherbrooke a few years back. Our waitress described this as Nonya's "rock & roll" period. 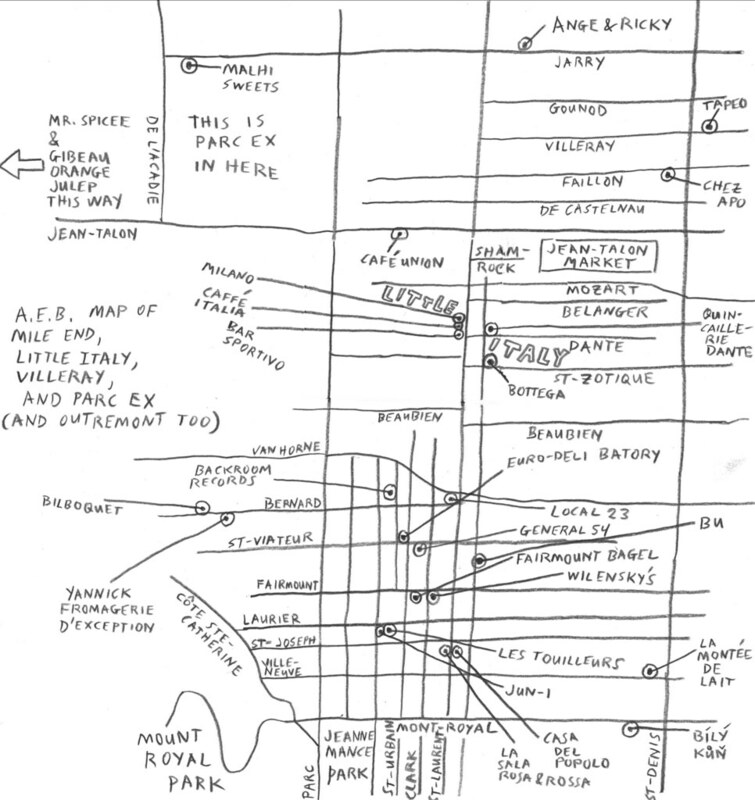 They then moved to an ill-fated location on Ste. Catherine just opposite Simon's and the massive Paramount complex. Their menu got more elaborate and their prices went up, but they didn't remain in that location very long. 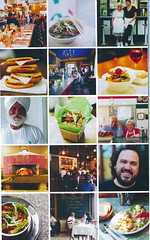 A few months ago now they brought their extensive menu up to an attractive space in Mile End. We had just finished our Gado-Gado and I had just finished going off on some little spiel about how some of the most important staples in Indonesian cuisine--peanuts and corn, for instance--are actually products indigenous to the New World that only arrived in the "Spice Islands" in the 16th century, but that they've been so thoroughly assimilated that it's as if they'd always been part of the culture (something like peanuts in West Africa), when Mr. S.'s krokett arrived. This was one of the most beautiful creations I've seen in a restaurant in quite some time. Maybe it was because it was so unexpected. Maybe it was because I'm so fond of pears. Whatever the case, we were bowled over by Nonya's faux pear with its Panko-encrusted skin and its sizzled Thai basil stem and leaf. It tasted great, too. The body of the krokett was made up of a mashed potato mixture, with a layer of spiced ground beef near the bottom. 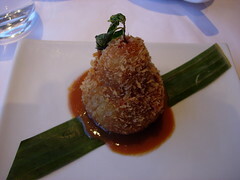 It was served in a pool of tamarind-based chutney. Anyway, the funny thing is, upon tasting it I was immediately reminded of the Colombian empanadas I'd had just a few days earlier, even with that Panko coating. It's a small world after all, and it's often a tasty one. All in all the food we had was quite good--everything from chicken satay to tilapia cooked in banana leaves--but Mr. S. was definitely the big winner that night. Not only did he get that standout krokett but he also ordered Nonya's outrageous roasted Cornish game hen with coconut rice, kecap manis, and stewed chayote. Nonya also offers a traditional Indonesian rijstafel. You need 2 people minimum, and the prices range from $35 to $55 per person. They also have a number of vegetarian options on their menu. p.s. Thanks for Mr. S. for the lovely digital pic.--eds. This was supposed to be a sun-dried strawberry jam, as featured in Chez Panisse's Fruit book. You can find a link to the recipe here. I followed the directions exactly and... Well, in this recipe, the strawberries are cooked briefly with sugar and then left to "dry" in the sun until the syrup thickens into a jam. Apparently, this method results in a particularly flavorful jam, one that truly does justice to the quality of the fruit. I left my concoction out for several days, in full sun, and the syrup got no thicker. I'm not sure what the problem was, but it may have had to do with the relative humidity here the week I made this jam, as opposed to in Berkeley. Whatever the case, by the fourth day I started to fear for my perfect berries. I strained the syrup, added pectin, which I never do, and cooked it to a jell stage. I then added the strawberries and put it into jars. I added a bit too much pectin. When you hold the jam upside-down, it doesn't even move. We are eating it now, and it's okay, but I can't help but think about what could have been, and what I thought would be. If anyone has had luck with that recipe, please let me know. Just to set the record straight: yes, the jam is a little firmer than I've become accustomed to around here, but it's hardly just "okay." 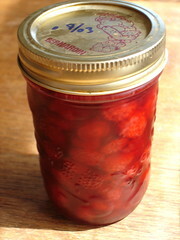 The strawberries + the hybrid method still resulted in one of the best strawberry jams I've ever tasted. Maybe even the best. Every year we make a pledge to find out when Colombia's Independence Day is, and every year we forget. You see, Montreal's Colombian community throws an annual fiesta for their Independence Day in Parc Laurier, and it's one of our favorite outdoor celebrations in this "city of festivals," but we can never remember exactly when it's held. 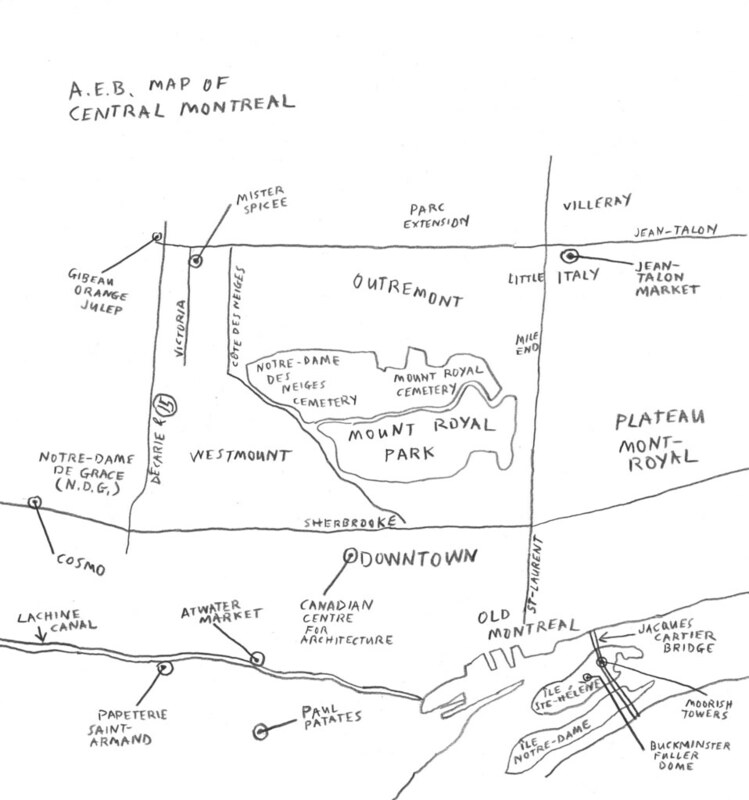 We always manage to chance upon it, though, because it's always held on a Sunday, and we're usually playing soccer in Parc Laurier on Sunday afternoons during the summer. Anyway, this Sunday we weren't playing soccer, but we did get a hot tip from Michelle's sister that a fiesta was afoot in Parc Laurier, so we hopped on our bikes and scooted on over to check things out. We love the Colombian festival because the music's always blaring, everyone's wearing that unearthly shade of amarillo Colombiano (usually in the form of a soccer jersey), it seems like every Colombian family in the entire city is there, and there's lots of tasty treats. This year we didn't have the biggest appetites because we hadn't been playing soccer for 2 hours before showing up, but Michelle hadn't had any lunch and I was in the mood for a snack so we lined up in front of the "Sabor Colombiano" tent and ordered some empanadas and a couple of arepas con carne (they were out of the con queso variety). 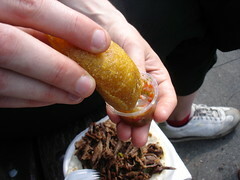 Of the two, the highlight was the order of Colombian empanadas, which are not at all like Chilean ones. The ones we had came stuffed with potatoes and pork and were deep-fried. The finished product had something almost samosa-like about it. The aji they were served with as a dipping sauce was spicy and garlicky. The verdict: delicious. We've now committed the date of Colombia's Independence Day to memory: July 20. Next year you can be sure that the Colombian festival we be held in Parc Laurier on the closest Sunday to July 20. See you there. 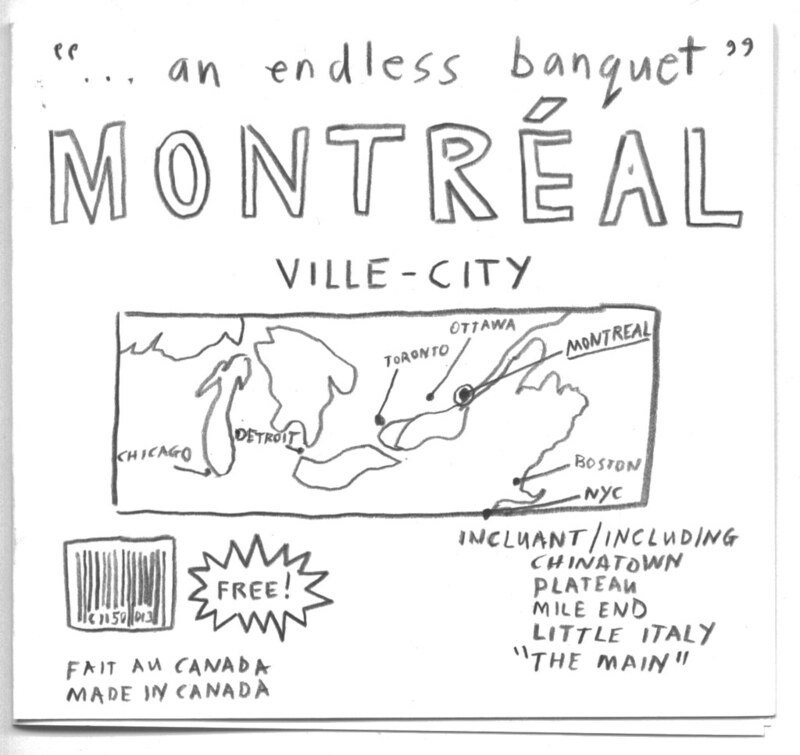 Considering just how devoted we are to Euro-Deli Batory, it's really kind of shocking how we've managed to all but ignore them thusfar in "...an endless banquet" (with the exception of a single, measly mention in our Montreal Food Guide). I think we overcompensated, or something, assuming that when we started this blog we'd end up writing every third post about Batory and their amazing homestyle Polish fare. I mean, really, if we're totally honest with ourselves, there's probably no other restaurant that we've frequented as much over the last 4+ years. True, our Batory habit was a weekly one a while back, and we've been going there much more sporadically over the last several months, but our devotion hasn't waned in the least. We're still just as committed to their perogie plates, to their kielbasa with spicy mustard (always the spicy mustard! ), to their cole slaw, and to their assortment of borschts. Everything is very authentic, the prices are unbelievably reasonable, and the people who run the restaurant are ridiculously nice. 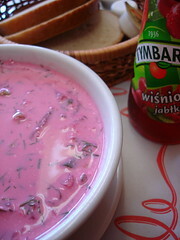 In the summer, one of our favorite treats is Batory's "Spring Borscht." It's creamy, it's got lots of dill and chives in it, and, best of all, it's cold. Few things taste as good on a hot, muggy summer day. And if you've got some kind of stupid summer cold, like I did last Saturday, all the better. This is all the tonic you'll ever need. Last week found me biking to an industrial building in Verdun to visit a professional food photo shoot. Les Chèvres' pastry chef, Patrice, was working on the pictures for his cookbook and he invited me to come and have a look. I am glad I did. First of all, the pictures they've done so far are incredible. True, his desserts are beautiful, but God knows a bad picture can ruin a beautiful subject. (And the reverse is also possible: a beautiful picture of a bad subject.) The best thing I learned was all the smoke and mirrors involved with food photography. Flipping through copies of glossy cookbooks can cause serious lifestyle envy for some. I count myself among those who dream of summering at the Vineyard, hosting clam bakes, and having drinks poolside. I don't even have matching silverware. Gorgeous pictures of food, as seen in said glossy cookbooks, make me feel woefully under-equipped and under-funded. I found the antidote to this affliction in Verdun, or at least the cause. Entering the space, you feel like you're in a long-forgotten storage unit used by a film production company. The lofts are cavernous and filled with large shelves. These shelves are filled with random things, like pieces of cloth, various glasses, boxes, some hunks of wood... I made my way through the different photo shoots until I reached the kitchen studio. A small table was set up for the plated desserts, surrounded by lights and screens. A huge camera was aimed at a piece of wood set on top of a mauve cloth. It looked so surreal. I couldn't help but look past what was framed by the camera: the wires, the mirrors, the piles of random props. I took the photo above of the noisette et pruneaux dessert from a different angle than the photographer did. It looks like any old snapshot of a plated dessert. 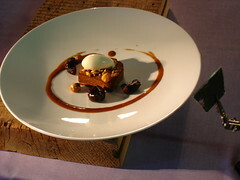 In this case, it's a hazelnut cake with caramelized hazelnuts, poached prunes and, oh-oh, was it chevre ice cream? You get the idea. A classic winter dessert. The picture, once it was taken, was so much more than the sum of its parts. The same hunk of wood and scrap of cloth suggested a rich leather sofa beside a fireplace in fall. You could imagine the cigar smoke lingering, the brandy, the dog sound asleep at the foot of the ottoman... After the Hunt, I called it. It was incredible how much they did with so little. And this was only the first picture. For the next dessert, the mood changed completely. A few changes to the lighting, surface, and colour evoked a lovely farmhouse in spring. The sun was streaming in through the screened off porch. My mind wandered from the house and into the charming country garden. The peonies which have been there since 1921 bloomed in profusion. The children were always careful not to disturb the flowers. I watched them take five different photographs, each with its own style. All of it was done with only a few props. Of course their camera was top-of-the-line, but otherwise it was very simple and understated. These people are professionals. They took great pleasure in photographing Patrice's beautiful desserts. Patrice Demers' book will come out in October. I highly recommend it, both for the recipes and the photographs. OK, so later last Sunday, we regrouped back at home after our fact-finding mission and got busy putting our market finds to good use. 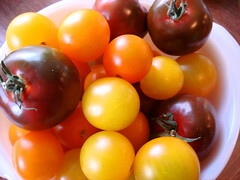 At Chez Nino we'd found these beautiful tomatoes in yellow, orange, and a dark purple hue. We asked if we could mix and match these tomatoes and the clerk put together a lovely basket of all three types, taking care to select the very best tomatoes he could find. We tasted them when we got home and decided that we'd use the dark ones for a salad, because they had more body to them, and the yellow and orange ones for a sauce. The salad was a classic tomato and bocconcini salad with basil and balsamic vinegar. The tomatoes were perfectly ripe and outrageously tasty, so you can just imagine how good the whole combo tasted. I took the yellow and orange tomatoes, blanched them, peeled them, and added them to some sauteed new garlic, some herbs, and a dried red pepper, and turned them into a devilishly spicy arrabbiata inspired by our sighting of the Our Lady of Pompeii church earlier that same day. We served the sauce with penne lisce and some crusty bread. A couple of years ago Michelle had made some absolutely magical stuffed zucchini blossoms for a small dinner party we threw. We decided it would be a good idea to bring back the magic while zucchini blossoms are still in season (note: the season is short), but we couldn't find the recipe Michelle had used the first time around, so Michelle did a little improvising. She stuffed them with chèvre, whipped up a simple beer batter (just beer and flour) and dipped them, and then fried them lightly in oil. 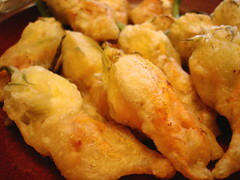 If you haven't had stuffed zucchini blossoms, do yourself a favor and try them out. They're really very easy to make, they look like a million bucks, and they make for a fantastic summer appetizer. Early on in our trip to the market, A. decided that he wanted to make this Roman salad he'd made before. The salad in question is made with fava beans, and when he saw that there were still some fava beans available at the market, he decided we simply had to make this salad. In addition to the fava beans, A. picked up some young asparagus, and then took us on a hunt for aged Pecorino--a hunt that ultimately led us to La Baie des Fromages. 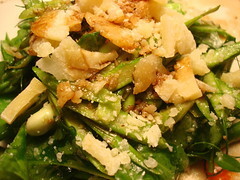 When he got to our place, he blanched the fava beans and the asparagus, shelled the beans, julienned the asparagus, added some arugula from our garden, and tossed them together, then finished everything off with some crumbled Pecorino and a light olive oil and balsamic dressing. 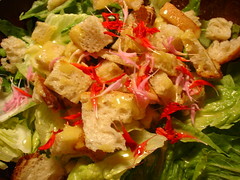 I'm not exactly sure what this salad is called, so I just called it Mr. G's Insalata Romana. All you really need to know is that it was divine. So our Sunday meal was made up of salads, of pasta, of olives, bread, cheese, and grapes, and then, when it was time to wrap things up, we did so in the only appropriate way: with our fresh strawberries. Michelle had carefully picked through the massive amount of strawberries we purchased and divided them into three groups: those that were fine for making strawberry syrup, those that were right for making strawberry preserves, and those that were so perfect we just had to eat them as is. Actually, in all honesty, there was a fourth group: those that didn't make the cut at all. These strawberries were so good, though, Michelle only found 3 out-and-out rejects in the whole batch. The picture below is of the crème de la crème de la crème. Fittingly, we served them with fresh cream. 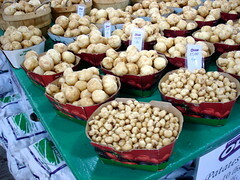 First of all, if you haven't been to the market lately, it's time you paid a visit. Summer started fairly early this year and we've had our fair share of sun and warmth, so there's already a lot of good, local produce pouring in: new potatoes, new garlic, and new onions, baby carrots, zucchini, beans, peas, and berries of all sorts (such as the ones seen above). We got things started right on Sunday by heading up to Jean-Talon with a friend of ours, A., and what started out as an innocent little visit soonly turned into a free-for-all. By the time we were done we'd picked up garlic, grapes, mangoes, tomatoes, peas, zucchini blossoms, butter, potatoes, cream, apricots, blackberries, bread, blueberries, asparagus, fava beans, cheese, probably a half-dozen other items, and lots and lots of strawberries. If you're serious about strawberries, the time to act is NOW. We were told the season had about 2-3 days left, max, and that was yesterday. From the perspective of a Quebec strawberry farmer, it's been a pretty bad summer--blistering heat, wild temperature fluctuations, torrential downpours--and consequently the strawberries have been good, but there haven't been many of them. From our perspective, it's been a pretty good summer and although the season for Quebec strawberries has been much too short, they've been awfully tasty. We picked up a $5.00 bucket, and they were so good we went back at picked up a massive $8.00 flat. 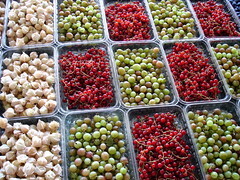 The best things that we saw at the market that we didn't actually buy were the grelots pictured below. They were about the size of champagne grapes. OK, maybe they were the size of raisins. Market find of the day: remember the good people from Olives et Épices, the de Viennes, that we wrote about way back when? Well, they've opened a new shop just a few storefronts down from their flagship store. While the Épices half of Olive et Épices focuses on the de Vienne's fantastic line of spices, herbs, and aromatics, their new store carries an impressive array of prepared foods from around the world. So, for instance, one tasting island they had set up had everything from salsa rojo and salsa verde, to chinese dates, to bombay-style snacks, to guava paste offer. 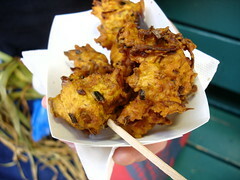 Meanwhile, out front they were serving fantastic freshly fried leek and carrot Bhajis with their homemade tamarind chutney for a very reasonable $2.00. The best non-market find of the day? Well, after we left the market we headed on what I can only describe as a fact-finding mission. On our way to our first secret destination we passed by an Italian cheese shop that A. had been tipped off to. So we slammed on the brakes and went in for a look-see. The somewhat oddly named La Baie des Fromages (1715 Jean-Talon E., 727-8850) is the Italian cheese shop I've been looking for in Montreal for years. Case in point: we were looking for Pecorino, and Pecorino we did find. Most places in Montreal, you're lucky if they've got 4 different kinds of Pecorino. At La Baie, on the other had, they had what could only be described as a vast array, from basic versions, to balsamico-infused versions, to top of the line, extra-aged versions. We took one taste of their top of the line model and we were sold. Of course, we would have bought just about anything from that cheesemonger with the wry smile and the penetrating eyes who served us. Highly recommended. Caesar Salad à la "...an endless banquet"
In my mind, one of the problems with contemporary food culture is what I would call “nomination anxiety,” or a fear of naming. We live in a no-nonsense, consumer-oriented, overly descriptive age, when the complexity of a dish is indicated not by the poetry of the name that is given to it, but by the number of hyphens, commas, and “with”s its name includes. The days when simple yet suggestive names like Clams Casino proliferated are largely gone, in their place we have things like “Baked Open-Faced, Hard-Shelled Clams Gratinée with Bacon and Pepper-Garlic-Oregano Salsa.” This problem is not unlike one that Anthony Lane brings up in his riotously funny review of Star Wars: Episode III—Revenge of the Sith in the May 23 issue of The New Yorker: “All those who concoct imagined worlds must populate and name them, and the resonance of those names is a fairly accurate guide to the mettle of the imagination in question.” Lane then goes on to compare the “flinty perfection” of J.R.R. Tolkien’s Mordor and Orc, with the work of George Lucas: Mace Windu, Bail Organa, Sith, and so on. This brings me to the topic of Caesar Salad. The most generally accepted account of the origins of its name goes as follows. Caesar Cardini operated a hotel (one that bore his name) in Tijuana that was a popular watering hole and resort destination for California’s elite, including the Hollywood Babylon set. On the Fourth of July, 1924, faced with an unexpected rush and a lack of ingredients other than salad fixings, he invented a salad that involved Romaine lettuce, croutons, Parmesan cheese, and a zesty, garlicky dressing with an olive oil, raw egg, and lemon juice base in an attempt to sate the hungry crowd. The salad was a hit and became a fixture of his menu, and the glitterati that frequented his hotel and restaurant soon spread its fame around North America and then around the world. 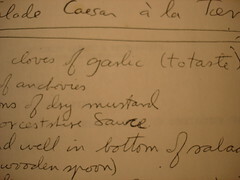 Whether or not this story is in fact accurate—there are numerous other stories floating around, including several of which that claim Cardini essentially stole the recipe—the Hotel Caesar was definitely one of its points of origin, many got their first taste of the salad there (including Julia Child, who visited the restaurant with her parents as a, um, child), and Cardini did much to try and capitalize on the fame of the dish, including opening a restaurant in Los Angeles, and bottling his dressing for retail sale in the years that followed World War II. By 1953, the recipe was being fêted by the Society of Epicures in Paris as “the greatest recipe to originate from the Americas in 50 years.” The story behind its name might have been fairly straightforward, but its name was made up of all kinds of powerful associations—of Italy and “Italian-ness,” of the beginnings of the Roman Empire, of 20th century cosmopolitanism, even of organized crime—and it quickly became the stuff of mythology. Flash forward to the early 1970s. Caesar Salads’s fame had continued to grow, but it still hadn’t become ubiquitous yet. It was still the kind of dish that distinguished the big city from the provinces, and it was an essential part of the repertoire of those who loved food and loved to entertain, including my parents. We were living in Ottawa at the time, between stints in the San Francisco Bay Area, and Caesar Salad was one of my parents’ showstoppers. The recipe they used had been given to them by their friend Terry, and I distinctly remember the ritual involved in preparing it: taking out the huge, oblong wooden salad bowl that was my dad’s preferred vehicle for his Caesar Salad, crushing the garlic and anchovies in the base of the bowl with a wooden spoon, whisking in first the egg and then the olive oil. I liked to watch Caesar Salad being made almost as much as I liked eating it. Last night we went back to the “Salade Caesar à la Terry” recipe that I’ve been toting around since I left home and went off to college as a teenager. We don’t have a big oblong wooden salad bowl, but we do have a couple of nice round ones. This recipe makes enough salad dressing for a huge salad, but instead of halving it or even quartering it, I just mixed up the full recipe in our bowl to properly season it, then poured the dressing into a jar, before seasoning the salad appropriately and then putting the remaining dressing in the refrigerator for later Caesar Salads. “Salade Caesar à la Terry” is a classic recipe, with a healthy amount of garlic and anchovies (which may not have been a part of Cardini’s original recipe, except in the form of Worcestershire Sauce), olive oil and lemon juice but no vinegar. The only change we made to it was that we added some Bee Balm blossoms to give the salad some color as well as a shot of peppery flavor, but mostly because we just happened to have some kicking around in our refrigerator [see "La Monarde," below]. God, it was delicious. We felt like those patrons of Hotel Caesar on that fateful Fourth of July back in 1924—we couldn’t get enough. Lea & Perrins': Look out for imitations! Place the garlic, the anchovies, the dry mustard, and the Worcestershire Sauce in the bottom of a wooden salad bowl and crush with a wooden spoon. Add the lemon juice and stir. Add the egg and blend with a wire whisk. Pour in the olive oil in a steady stream, whisking the whole while. Add salt and pepper to taste. Pour the dressing into a jar. Place the Romaine lettuce (broken into manageable pieces) into the seasoned bowl. Add the croutons and the grated Parmesan cheese. Dress the salad with an appropriate amount of the dressing (again, this recipe makes a large amount of the dressing, enough for a big dinner party). Save the remaining dressing in the refrigerator. Serve as an appetizer, or as a meal with a crusty loaf of bread, a cheese plate, and a crisp white wine. There are numerous perks that come with Michelle's position in the pastry kitchen at Les Chèvres, but one of the best is that it allows her access to the very finest in wholesale produce from time to time. That case of fresh peas we polished off last month was evidence of this. 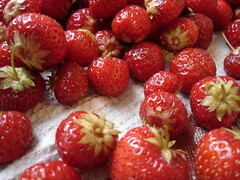 There's also talk of scoring a couple of flats of the very best Quebec strawberries over the next few days. But then there was the bouquet of "La Monarde," a.k.a. 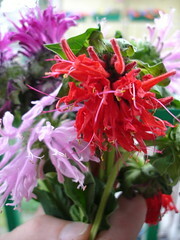 Monarda Didyma, Bee Balm, Bergamot, and Oswego Tea, that Michelle brought home earlier this week. A small grower who specializes in edible flowers came in to the restaurant a few days ago and sold them some of this year's harvest. Michelle, who happens to be a huge fan of edible flowers, saw them, nearly swooned, and then asked this gentleman if she could get a "bouquet" from him to take home. Said grower was apparently put off by this question, thinking that Michelle had mistaken his flowers for those one might actually present as a bouquet, or him for a lowly florist. The kitchen staff found this little incident rather funny, of course, and hours later Michelle got her bouquet of Bee Balm to take home with her. 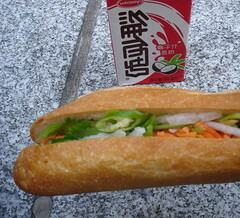 Banh Mi from Cao Thang and Vitasoy's coconut drink: the perfect lunch? I first got hooked on "Banh Mi"--Vietnamese submarine sandwiches--when I came to Montreal as an undergraduate years and years ago now. I came across them not in "Chinatown," where the greatest concentration of Vietnamese shops and restaurants, and therefore Banh Mi shops, now stand, but on Ste-Catherine just to the north. I was walking down Ste-Catherine one winter's day around lunchtime when I saw a sign advertising sandwiches vietnamiennes, so I popped into this small fast food restaurant (long gone now) and tried one. Vietnamese sauteed vegetables, tofu, Japanese mayonnaise, hot peppers, cilantro, and a soy-based dressing served inside a mini-baguette--I found them irresistible right from the get-go, and although the area I was coming from (Northern Virginia) had loads of Vietnamese shops and restaurants, I'd never seen anything like them. These days, my favorite Banh Mi shop is a tiny little place called Cao Thang located on the west side of St. Laurent between René-Lévesque and de la Gauchetière next to a jewelry shop. 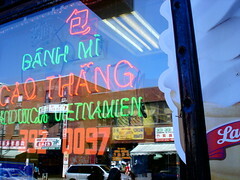 I started going there in 1999 when I returned to Montreal, and although I know a lot of other people that favor other Banh Mi specialists in the area, I've tried those other guys, and Cao Thang is still by far and away my favorite. Thursday, Michelle met me for lunch and we rode our bikes down to Cao Thang to pick up a couple of Vietnamese Subs, some of their excellent spring rolls, and a couple of drinks for a picnic. Upon digging in, Michelle declared that she could have the same lunch "every day." I'm not sure if I'd go that far, but there is an argument to be made that this is the perfect lunch. It's delicious, it's satisfying, and it's so inexpensive. Years of inflation have only nudged the price of a 6" Vietnamese Sub up to $2.50. An order of Cao Thang's fresh spring rolls will set you back $3.50, but you get 3 spring rolls, and they're packed with vermicelli, bean sprouts, herbs, and 3 medium-sized shrimp each (!). Where else can you get 9 shrimp for $3.50? 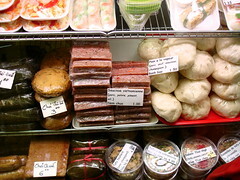 Cao Thang's display coolers are filled with all kinds of tempting and colorful delicacies, including steamed BBQ pork buns, savory-filled feuilleté pastries, and a whole assortment of rice dishes, including the one whose name we like the best: Riz de Bonheur. Recommended: Grilled Chicken, Grilled Pork, and Vegetarian Banh Mi. What follows are our answers to the “The Cook Next Door” "meme" created by the folks at Delicious Days . What does it all mean? Well, a questionnaire is developed and then it's fired off to a number of individuals. They compose a set of answers, then "tag" someone else. And so on, and so on, and so on. Thanks so much to Pim for inviting us aboard. We had a lot of fun developing our responses. aj: I remember moving to the States from Canada in 1976. Bicentennial fever was everywhere. I was 6, so you can imagine my first impressions of “America”: block parties, “Yankee Doodle Dandy,” parades, historical reenactments, etc., etc. I knew it was a special year and all, but I kind of thought “America” was going to be like that every year. In retrospect, the whole year felt like we were inhabiting Disney’s “Main Street, U.S.A.,” and it’s not like we were living in Middletown or something, we were living in suburban California. Hell, my cousin Bobby and his wife Nicole came to visit from New Brunswick that summer, and even they got swept up in the fervor. Nicole helped me dress up my bike with a jigsawed wooden horse’s head so that I could participate in a kids’ bike parade as Paul Revere. We had another big block party again the next year for the 4th of July, but it just wasn’t the same. The year after that we stopped having block parties. Anyway, all of this is to say that I remember I got really into early American history during this period and around the same time I also got my first cookbook (I don’t remember the name of this cookbook, but it was some kind of cookbook for kids with spiral binding). I learned about the importance of corn to the diet of the early settlers and I became obsessed with Johnny Cake. I distinctly remember waking up early one Saturday morning to watch cartoons and mix up a batch of Johnny Cake when I was 6 or 7.
aj: There’s no question here that it was my mom. Food and meals were always an important part of our family life, and my mom was/is an excellent cook. She also encouraged my sister and I to cook at an early age and I even took a couple of cooking classes when I was about 9 (I remember that I liked these a lot more than I liked my piano classes). My parents also did a lot of entertaining when I was young—I knew what made for a good dinner party from an early age. Also especially influential: my maternal grandfather, Grandpapa Freddy, who was a chef and a hotelier based first in Quebec and then in New Brunswick, and my paternal grandmother, Baba, who taught me a great appreciation for Slovak cuisine in particular and Eastern European cuisine in general. m: My mom, but I’d rather not say how or why. aj: Unfortunately, most of our family photographs from my childhood are locked away in storage in Virginia. I do remember a good shot of me and my friend Greg Meier wearing a couple of my grandfather’s old chef’s toques as we prepared Beef Burgundy, though. In its place I’m including an old photograph of my grandfather wearing one of his chef’s toques, back in the day. I like to think that this is the toque I was wearing some 50 years later. 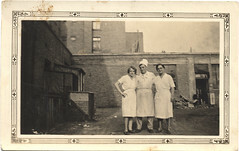 On his right is my grandmother; on his left is an unidentified woman. The photograph was taken in Quebec City, where my grandfather began his career in the hotel business. m: No. Among my people we evidently believed that photographs would rob one’s meal, if not one’s soul. aj: Haven’t encountered one yet, although I find Hollandaise sauce terribly enigmatic—even when you think you know all the tricks, it can turn on you so quickly. m: Apparently I’m “hyper” about hygiene when it comes to cooking chicken. aj: I’m not real big on kitchen gadgets. That’s more Michelle’s forte. I got along just fine before my mom got me a Wusthof zester, but it works like a charm and I’ve definitely made a whole lot more dishes with lemon and orange zest in them since. m: I use my heat-proof spatula for almost everything, regardless of whether it needs it—my whisk, too. I’m also rather proud of my collection of cherry pitters. Can’t think of any major letdowns, but the fact that I am still without a standing mixer is a perpetual source of shame. aj: For a long time now, I’ve liked ice cream and beer, late at night. Not some kind of weird float or anything, just a cold beer and a bowl of ice cream while I watch a late-night movie. This combo really doesn’t seem that strange to me, but it always seems to get a reaction. aj: Poppy seed bagel (Fairmount Bagel, or something comparable); smoked salmon (Wolf’s Head (N.B. ), or something comparable); cream cheese (Western Creamery, or something comparable). m: Wine, cheese, and bread. Q: What’s one dish you prefer to leave to “the experts”? aj: Sushi—I’ve never really been drawn to making sushi at home. Among numerous other reasons, I crave the atmosphere of a good sushi bar. m: Magret de Canard--the chef at Les Chèvres gave me the rundown once on what it takes to make Magret de Canard. Yikes! aj: Rum-Raisin, although Berthillon’s Plombière was a true revelation. aj: Cats and dogs. This issue actually came up at a dinner party we attended not so long ago: where would we draw the line? As adventurous as I may be when it comes to cuisine, there are some places I don’t have to go. I’m curious, but I don’t have anything to prove. m: Brains of any kind. 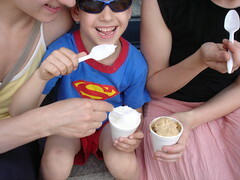 So, first and foremost, this entry is on the topic of ice cream. 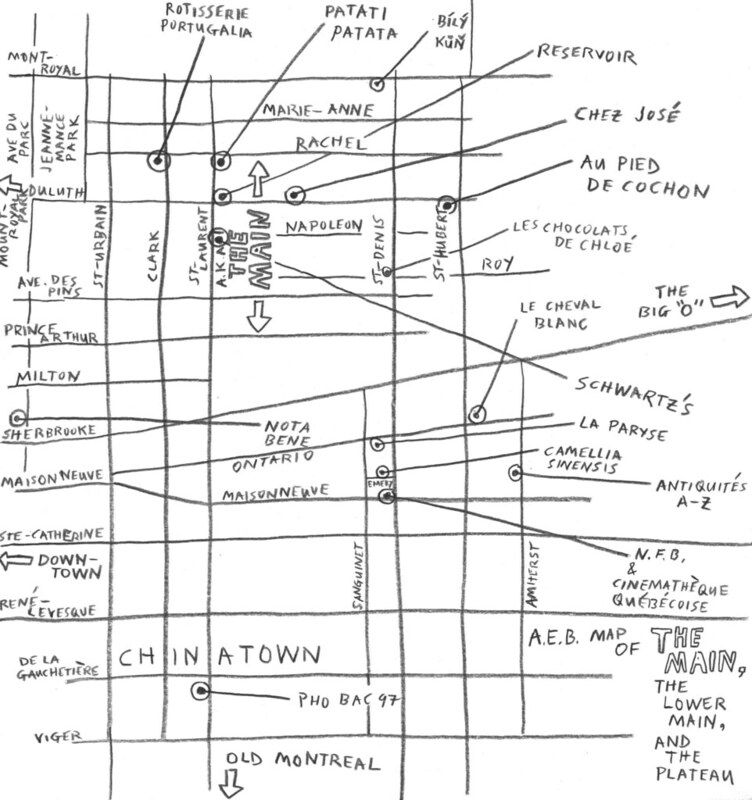 Secondly, it features three places where you can get ice cream in Montreal that begin with the letter "R". And thirdly, but importantly, this entry focuses on affordability at a time when the price of just a simple summer ice cream cone has inflated to absurd proportions at many of the city's crèmeries. What a lot of people don't realize, though, is that Roma also serves up their own homemade gelatos and sorbettos from a small counter inside. You can't get a cone there, but you for a mere $2.00 you can get a very generous portion of, say, their fine Limone, with just the perfect balance of sweet and tart. 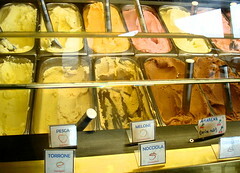 Then you can park it on St. Laurent, savor your flavor, and take in the colorful Little Italy scene, like we did. Operating out of a tiny little storefront located right in the thick of the action along the Main north of Avenue des Pins, Ripples has been a frozen dessert hot spot for almost 20 years now. They feature two prize-winning flavors: their French Vanilla and their unbelievably intense 6x Chocolate (otherwise known as Chocolat XXXXXX), but our favorites also include their spicy Ginger, a rather powerful Capuccino, and their wonderful sorbets, including Guava-Grapefruit and Strawbery-Banana. Best of all, the prices at Ripples have remained very reasonable, and on those days when you just want a teeny-weeny little taste of something, you can still get a mini (we prefer to call them "micro-minis") there for a mere 50¢ (!). Last, but not least, depite the fact that Montreal has a rather sizeable Italian population, the city is shockingly devoid of gelaterias. One of the only true gelaterias in town, and an exceptionally good one at that, is Roberto's, located on the eastern fringes of Little Italy. 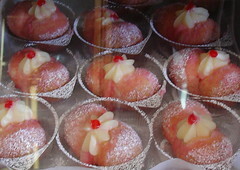 All the classics are there, including Baci, Torrone, and Zuppa Inglesa, but on a recent visit, it was the sorbettos--like Pear and (especially) Litchi--that were blowing us away. And, once again, the prices at Roberto's have remained very reasonable. A single only sets you back $2.25, while a double is only 50¢ more.